This map, indicating the Black Oak Industrial Park, was created last year for the City of Vanceburg. 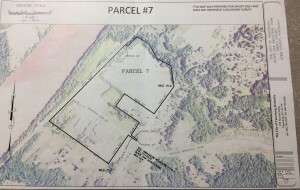 Information on the map indicates it is an Annex Exhibit, one of several created for proposed annexation. Some of the parcels named in a group of exhibits created at the same time have already been annexed into the city. Black Oak area residents are moving ahead with efforts to keep their community, or portions of it, from being annexed into the City of Vanceburg despite assurances from Mayor Dane Blankenship that there are no plans to do so. About 50 gathered on February 18 to discuss the possibility of being annexed into the city and ways to avoid it. The majority of those attending were against their community becoming a part of Vanceburg. The next meeting has been set for 6:00 p.m. Monday, March 18, at the Black Oak Fire House. Organizers have invited Judge Executive Todd Ruckel and County Attorney Benjamin Harrison to attend the meeting and provide their perspective and answer questions. Brady Brewer led the February 18 meeting and distributed copies of maps and legal descriptions of areas from the existing limits of the City of Vanceburg east to the Ronald Reagan Connector Road. He said the Black Oak Industrial Park is included in the maps and legal descriptions he obtained.